Are you frustrated with your YouTube and video marketing efforts? Most business owners test the “YouTube waters” by uploading a few videos, then walk away. They return in a few weeks to notice each video has only a handful of views. In this article, I’m going to reveal to you five of the most powerful steps that you can put into action today to literally breathe life back into your existing videos, so your YouTube marketing efforts won’t be in vain. Reworking keywords is the best place to start when working with your existing videos. Using Google’s Keyword Research Tool, you can quickly uncover the exact questions, topics and issues your buyers are searching for, and you can market your videos accordingly. Once you’re logged into YouTube, simply click the “Edit” button above your video and you can change, tweak and improve your video information in seconds! 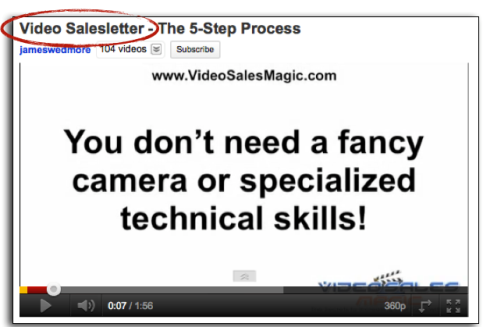 This video is ranked #1 on YouTube for "Video Salesletter." The keyword is in the title AND description. Do this properly, and your video will start to get ranked at the top of YouTube and Google for your keyword. And this will obviously result in more targeted views! If your video does not tell people what to do or where to go after the video ends, your viewers are simply going to move on and forget about you completely. You need to tell people precisely what to do next and exactly how to do it. Here are three ways you can add a call to action to each of your existing videos to convert each view into highly targeted traffic. Use the Call-to-Action Overlay: This powerful, fully customized banner ad allows you to direct viewers straight to your site by clicking on the button right inside your video. It takes a few minutes to set this up, but it’s totally worth the extra effort! To add YouTube’s call-to-action overlay to all of your videos, sign up here. Put your domain in the description: Don’t forget to add your domain name (with the “https://”) at the beginning of your description. It is simply another place people can click to go directly to your website. Notice the full domain name is at the beginning of the video description. To add your URL, simply click the “Edit Video” button at the top of your video’s page once you’re logged into your account. Add Annotations: Annotations can be extremely beneficial if used properly. They take about 30 seconds to create, and can do wonders for your videos. You can’t turn annotations into clickable links that direct visitors to your website, but you can get people to subscribe, like your video or watch the next one in your playlist. Use annotations to direct viewers to your next video. Adding annotations is fun and easy. Once you’re logged into your YouTube account, simply click the “Edit Annotations” button directly above your video. 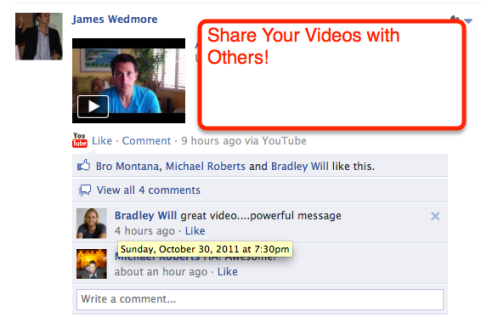 This is one of my favorite strategies, because 99% of video marketers simply fail to do it! Head on over to Fiverr.com or pay 12-year-old Billy down the street to write out a complete transcription of your video and save it as a .txt file. Then, upload the transcript to YouTube so they can sync it with your video. Once you’re logged into your YouTube account, click the “Edit Captions” button directly above your video and follow YouTube’s instructions for uploading. Using magical software, YouTube will now index every single word of your transcript (your video’s dialog) and incorporate it into its search algorithms. 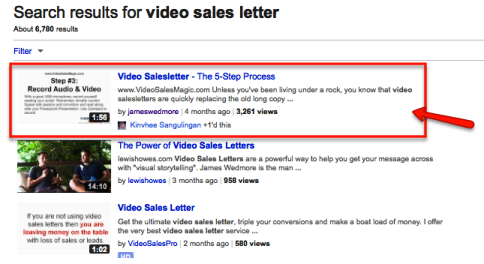 You’ve just put your video SEO (search engine optimization) on steroids! Uploading your transcript is as simple as selecting the .txt file and uploading it to YouTube. Most people will never upload a transcript, and YouTube is forced to determine what a video’s topic is based solely on the video’s headline and description. You’ll have the upper hand with a complete transcript of your entire video! Anyone who has ever had experience with SEO knows that Google loves backlinks to your website. This same concept applies to YouTube and ranking your videos at the top of search results. Whether you hire someone to do this for you, use a service or do it yourself, adding a few backlinks or inbound links to your video AND your channel URL will make a considerable difference in where your videos will rank, and ultimately how many views you’ll receive. Getting to the #1 spot in YouTube search results can make a difference of several thousand views! Once you’ve completed all of the steps above, it’s time to go back to your sphere of influence and share your updated video with your friends and followers. I like to embed my video on my blog and share the blog post with my email subscribers and my social media followers. Remember to share your videos on Facebook, Twitter and Google+. Make sure to include a simple call to action and ask your friends and fans to share the video with their friends for that extra boost. This is the easiest step, but if you want more views, sometimes you’ve just got to ask! At the end of the day, the time, effort and energy you put into creating an incredible “video of value” is far more extensive than sending out a quick tweet or updating your Facebook profile. Your video marketing efforts should never be in vain, and if you spend a little time on the “video aftermath” (everything you need to do AFTER your video is on YouTube), you’ll begin to see your video work for you for a long time to come! Take the time to revamp all of your existing videos using these five simple action-steps. As long as you have created a “video of value” that is worth seeing and worth sharing, the views will happen! What do you think? Do you have any tips to share? Leave your questions and comments in the box below. James is the founder of Video Traffic Academy. James shows others how to use the tools and skills they already possess to harness the power of video to grow their business.